In a networking technology that uses messages to send data, there are a number of tasks that must be undertaken in order to successfully transmit the data from one place to another. One is simply the addressing of the messageputting an address on it so that the system knows where it is supposed to go. Another is transmitting the message, which is of course sending it to its intended recipient. There are several different ways of addressing and transmitting a message over a network, One way in which messages are differentiated is in how they are addressed, and to how many recipients. Which method is used depends on what the function of the message is, and also on whether or not the sender knows specifically whom they are trying to contact, or only generally. To help explain these different methods, I will use a real-world analogy. Consider a social function with 300 people that is being held in a large hall. These people are mingling and are having different conversations. There are different kinds of messages that may need to be sent in this setting, much as is the case with networks. Unicast Messages: These are messages that are sent from one device to another device; they are not intended for others. If you have a friend at this social event, this is the equivalent of pulling him or her aside for a private conversation. Of course, there is still the possibility of someone else at the event overhearing your conversationor even eavesdropping on it. The same is true in networking as welladdressing a message to a particular computer doesn't guarantee that others won't also read it, just that they normally will not do so. Broadcast Messages: As the name suggests, these messages are sent to every device on a network. They are used when a piece of information actually needs communicating to everyone on the network, or used when the sending station needs to send to just one recipient, but doesn't know its address. For example, suppose a new arrival at the social gathering saw a blue sedan with New Hampshire plates in the parking lot that had its lights left on. He of course does not know whose car this is. The best way to communicate this information is to broadcast it by having the host make an announcement that will be heard by all, including the vehicles owner. In networks, broadcast messages are used for a variety of purposes, including finding the locations of particular stations or the devices that manage different services. Multicast Messages: These are a compromise between the previous two types: they are sent to a group of stations that meet a particular set of criteria. These stations are usually related to each other in some way, such as serving a common function, or being set up into a particular multicast group. (Note that one can also consider broadcast messages to be a special case of multicast, where the group is everyone. Back to our analogy: this would be somewhat like a group of friends who go to this large social hall and then stay together in a small discussion groupor perhaps use radios to talk to each other from a distance. 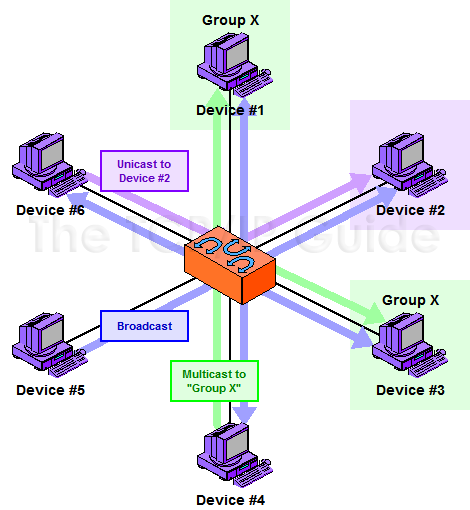 Multicasting requires special techniques that make clear who is in the intended group of recipients. The three basic type of addressing and message delivery in networking are illustrated in this simplified local area network. Device #6 is sending a unicast message to #2 shown in purple. Device #4 is sending a multicast message to multicast group X. In this case, that group includes devices #1 and #3, shown in green. Finally, Device #5 is sending a broadcast message, which goes to all other devices on the LAN.